Born in 1906 of parents Sir Edwin Lutyens and Lady Emily Lytton, Elisabeth was one of 5 children. By the age of 9 she had already decided she wanted to be a composer and studied music first in Paris (where in the 1920’s she became enthralled by the music of Debussy) and then in London at the Royal College of Music where she studied the viola and composition. During the 1930’s and 40’s her life was taken up more with marriage and children though from 1937 through to 1942 she wrote her six string quartets. Elisabeth was a radical and a strong individual which comes across in her music. As a composer she was given the nickname “Twelve Note Lizzie” in recognition of her love of serialism and as a person, she could be highly argumentative and even snobbish though many also found her to be a very intelligent, articulate and charming woman. She died in 1983. 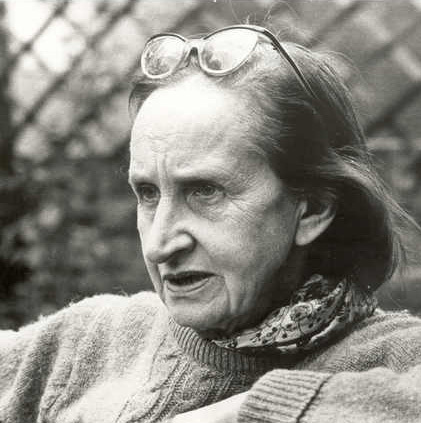 In 1960 Elisabeth Lutyens wrote “Quincunx” in which she revived the use of a quartet of Wagner Tubas. It is notable however that at no time do the players double on horns in this work. She also opted to write for the 4 instruments all in F, claiming that it was a matter of practicality from the players’ point of view. No other scores have the tenor tubas described as F instruments.